This is our faithful reproduction from an original 1930's Lucas Dashlamp Type D43, also referred to as the Divers Helmet Dashlamp. 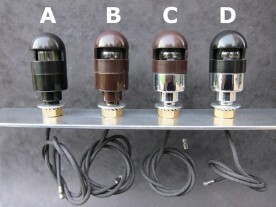 It is generally accepted that it is almost impossible to find original complete Lucas D43 dashlamps as usually, the caps would go missing leaving the bases exposed and prone to damage. The whole unit would then need to be replaced with a modern alternative that was similar but not an exact reproduction for the MG.
a brass metal spun base with the collar depth of 9/16" and the diameter 1 1/8"
the depth of the exposed part of the cap should be 1 3/8"
Our D43 lamps incorporate all of the above features and these correct lamps are only available through Vintage MG Parts. We no longer sell spare covers as we discovered that there were at least two different types of bases used by MG and the sleeve section on the top could vary. We also supply black dashlamps for the L1, L2 , J3 & J4 Types (also optional for F2 & J2) and P Type dashboards. Please state your colour choice when ordering.